?guesswhat? is a tool for creating and using game grids which can be used in any lessons for teaching. The idea is to provide a game grid with categories and points, which are connected with questions and answers. You will be able to provide any kinds of points, categories, questions and answers for the game. 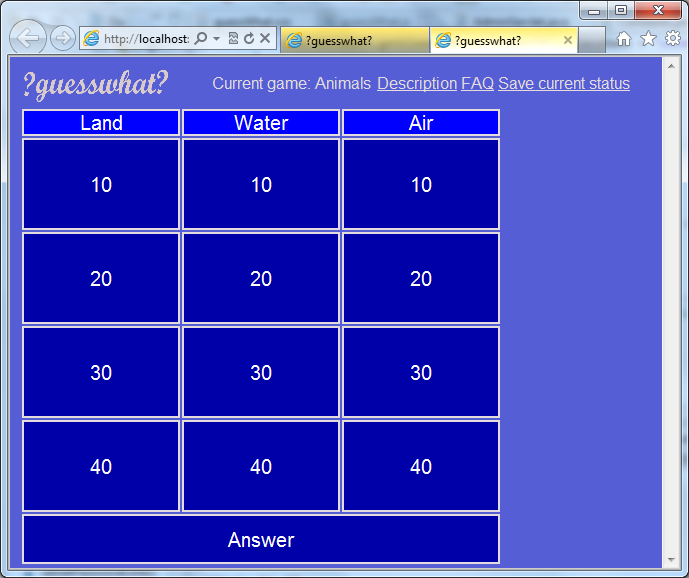 In the game modus you can click on any field and the question will appear. After that you can click on the answer field and the answer will appear. Therefore you can incorporate quiz games in your lessons. The games you design can be used privately (only by your account), public - protected by a password so that you can decide who will be able to use your game or complete public without any password so that everybody can use your game. The ?guesswhat? account is free and easy to use. For the account generation you'll need to provide an eMail address as you login account.